A Catoosa County attorney is not sure whether the commissioners were allowed to discuss hiring new school resource officers in private two weeks ago. Clifton "Skip" Patty said Friday he thought the issue was exempt from Georgia's Open Meetings Act because the elected officials were discussing public safety. But when a reporter asked him about the exemption, Patty said he could not find it in the state's code section. "We're trying to find an exemption," he said, "but there doesn't appear to be one, surprisingly." On March 6, the county commissioners met with Schools Superintendent Denia Reese in executive session, away from the public. After the meeting, Commission Chairman Steve Henry said the elected officials agreed to fund five new school resource officers, beginning next school year. Including benefits, the officers cost about $80,000 each. The county government and school system would split the price for the five new officers. Henry said the commissioners will have to agree on that at a public meeting as they form their budget for the next fiscal year. Asked about going into executive session on the issue, Henry said earlier this week he relies on the county attorneys in making such decisions. Patty said he believed the school resource officer discussion should be away from the public because they were discussing safety issues. The five new school resource officers will work at the county's 10 elementary schools. Each officer will be assigned to two schools and rotate between them. Patty said the commissioners talked in private about how the officers would split their time. If that were discussed in public, Patty said anybody would know when a specific elementary school was unmanned. "If something like that shouldn't be discussed in executive session," he said, "I would want a court to look at it. Because it's not something I want the public to know and to be spread in the [meeting] minutes of the county." Also during the March 6 meeting, the commissioners brought Ringgold Youth Sports Association Director Earl Epps into executive session. The county put Epps and RYSA on a probationary term last year, after a Georgia Bureau of Investigation inquiry into how he used his money. A prosecutor declined to pursue charges against Epps after the investigation. But the county told Epps he had to obey certain terms if he wanted his youth sports teams to use county gyms and fields. Patty said the discussion with Epps was done in private under the "personnel" exemption of the Open Meetings Act. But Epps is not a county employee. When a reporter raised this issue, Patty said, "I guess, technically, it might not [fall under that exemption]. But it could fall under the litigation issue, because Earl isn't going to take that lying down." 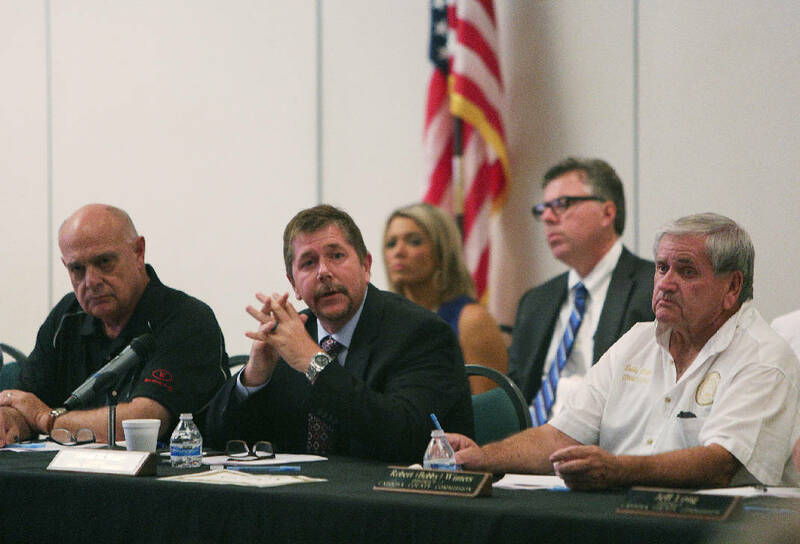 A litigation exemption applies when county commissioners discuss lawsuits. Asked about being pulled into executive session two weeks ago, Epps declined to comment. David Hudson, an attorney on the First Amendment Foundation's board, said the issue "does not sound like a matter that could be discussed under the attorney-client privilege [exemption], since there was no pending litigation or threat of litigation or a claim." Patty said the county commissioners do not plan to hire someone to help them search for a replacement for Jim Walker, who resigned as county manager on Feb. 20. The county brought in an outside consultant when they hired Walker in 2015. Patty said the county will advertise the job opening on the local government website, the Facebook page, indeed.com, the Georgia Local Government Personnel Association website and the Association of County Commissioners website. The county also is looking to hire an accountant, who could eventually replace Chief Financial Officer Carl Henson. Contact staff writer Tyler Jett at 423-757-6476 or tjett@times freepress.com. Follow him on Twitter @LetsJett.